Potato facts, an information sheet for kids cooking activities. Potato facts and general information about potatoes. Potatoes grow underground and are dug up in autumn time. Choose potatoes that are firm, heavy and with no cuts or cracks. 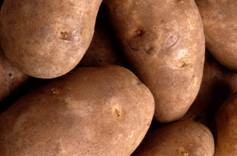 There are different varieties available to choose from including red potatoes, baking potatoes and Russet potatoes. Store in a cool dark and dry place. Peel and cut in cubes or slices. Boil, fry, bake as is for a baked potato. Make potato salad, mashed potatoes and side dishes. Potatoes are a good source of carbohydrates. 1/2 cup potato, cooked is one serving. They are full of Vitamin C and Vitamin B6. Potatoes also have fiber in them. Place potato fries on cookie sheet. Toss oil and seasonings together and toss over potato fries. Bake 425 for 15-20 minutes. Cut potatoes like apples slices, or wedges. Sprinkle salt and pepper, and generously brush with olive oil. Put pan on stove (preferably nonstick) and toss in all potato slices. Fry on high heat for approx. 5 minutes, or until reaching crisp golden color. Stir regularly to ensure all sides are fried evenly. Put on low heat and pour a small amount of olive oil. Turn off stove in 3 minutes. Back to Food Facts from Potato Facts.